1 double bed, 1 twin bed, 1 bathroom, sleeps up to 4 adults or 2 + 2 children. With 320-degree views of the stunning Saastal valley, this apartment is a spacious and comfortable base at any time of the year. It sleeps up to 4 people with one double bedroom, a twin bedded bedroom. There is a fully equipped kitchen and a bathroom with WC, bath and shower. Also free wifi is available. The views from the south-facing balcony are mesmerising and include all the main mountain peaks and almost the entire valley floor from Saas Grund to Saas Almagell . Situated in a quiet part of this picturesque alpine village but only a 10 minute walk from the centre, the apartment is adjacent to the free bus stop offering easy access to the ski slopes. Already for the second time we enjoyed the warm atmosphere of the spacious apartment. The apartment is located directly at the bus stop in the quiet Wildi area of Saas-Fee, but also walking to the main town is easily possible (20-40 min). We parents enjoyed the view over the valley, the kids (two teens) enjoyed that also WLAN is available :). The contact to the owners is straightforward and questions had been answered always at short notice. Many thanks to Vanessa and Ed. Best view in Saas Fee? Really enjoyable stay, Haus Bettina has all the facilities you need for a great holiday,and is clean and comfortable . Situated on the edge of the village so nice and quiet with great walks starting from your doorstep. Pleasant stroll down to the shops for breakfast essentials . I really don't think there can be an apartment with better views over the valley and mountains. Dear Penny, how very kind of you to give us such a nice review, we have always loved Saas fee and our apartment and I'm really glad you had a super holiday in a special place, your more than welcome to stay again at a discounted rate in the future, best wishes Ed and Vanessa Hothersall. We had a lovely stay at House Bettina. Perfect location, very clean and spacious. Very comfortable and well equipped. Skiing was brilliant, lovely village. Perfect for a family holiday. 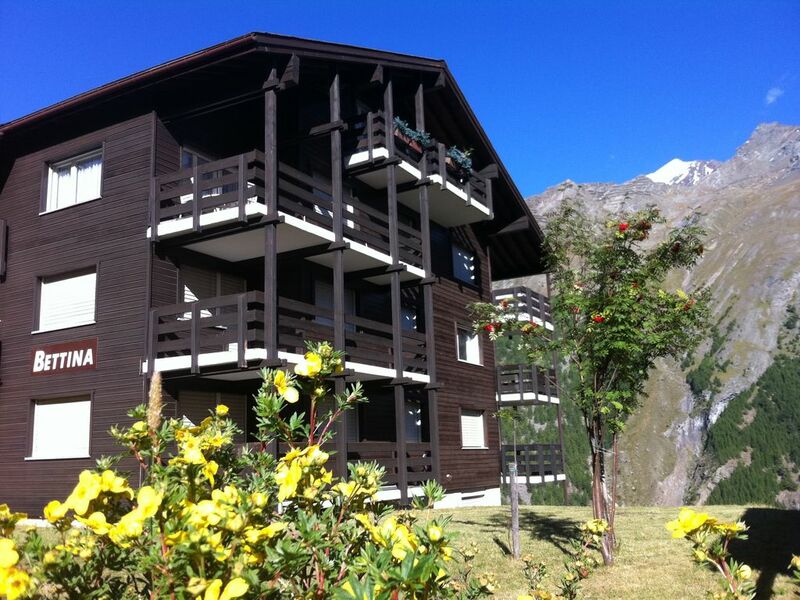 I have spent both summer and winter in Saas Fee, staying at the Haus Bettina. There are many things which I think set Saas Fee apart from other alpine villages, which include it being a car-free village which has and is not over-developed as a holiday destination and retains a great part of its heritage and character. It also works as a Swiss Village with it's own rustic and colloquial charm (and genuine locals), but it still has that slick and efficient edge which the country is known for. Food is of course great and there are no shortages of good places to eat. The walks around Saas Fee are fantastic in the summer - from easy strolls in the lower hills to meet the marmottes and chamois and goats to more challenging climbs up the beautiful surrounding peaks or down to the valley. As there is a glacier above the village you can reach the snow and watch the various international teams which practise there. Skiing in the winter is fantastic - the glacier helps to keep the snow - and each time I've been there the mountains are beautifully cloaked in snow and just look perfect! Haus Bettina is perched at the edge of the mountainside, so you can peer down to the valley below and you can literally have your breakfast and watch clouds float past the window then eat your dinner and see the moon over the mountain - the views from the apartment are I think the best for the whole village - I have countless photos of sunset and sunrise from the balcony. The appartment is tucked back from the main shops so you aren't in the crowds, but it is literally a 5 minute walk to the shops and 3 minutes to the patisserie for your morning baguette. There are also electric buses to take you to the slopes, but I find that a walk in the morning is the best way for your pre-ski warm up! The apartment is great - light, modern and clean but also cosy and warm And as is the Swiss way, everything serves a useful function. It is also a hop, skip and a jump away from the fabulous Alphutte (very good food). Anyway I love it and I highly recommend Haus Bettina - you really get the most out of Saas Fee and the mountains there. I think it would be very hard for me to find anything which could live up to it! Wir haben uns sehr wohl gefühlt, auch wenn die Einrichtung der Wohnung wohl schon etwas in die Jahre gekommen ist. Skiraum im Keller vorhanden. Skibus hält direkt vor der Haustür. Sehr ruhig gelegen. Mailverkehr mit dem Vermieter war sehr nett. Wir können uns vorstellen, diese Unterkunft nochmal zu buchen. An absolute pleasure to have Daniela and her family as our guests. We would welcome them back anytime. We spent a week in Haus Bettina (two adults and a teenager) and had a lovely time. The apartment is very conveniently situated next to the "little train" stop into town and even more conveniently next to the N° 4 bus shuttle straight to the bottom of the slopes. The walk is not too long but the bus ride is really very quick! The views (as expressed by other guests) are spectacular, always changing and beautiful. It was a little chilly to sit outside in the mornings but there is space to eat out on the balcony when the weather is warmer. The apartment itself is simple but very comfortable, quiet and clean; it is also reasonably spacious. The beds are comfortable and we all slept very well. Plenty of cupboard space, both in the rooms and in the kitchen: fantastic. The "chalet style" dining area is charming as are the pictures on the wall. The Wifi worked well, so it was possible to work and communicate with the outside world! Saas Fee is a wonderful village, and this year in addition to the skiing and great restaurants we discovered the Allalin spa, which was fabulous. Thank you Ed and Vanessa, for a great week away! Saas Fee really is a superb and magical traffic free resort for both winter and summer. It has an excellent winter snow record due to the village’s 1800m altitude and offers 100 kms of ski slopes along with plenty of wonderful hiking. Summer skiing is also possible due to Saas Fees own glacier, whilst the hiking available ranges from quiet nature trails to high altitude treks. There is also ice climbing on the highest peaks. This village offers something for all age groups and extensive activities for both winter and summer. Please do not hesitate to get in contact for any further information on booking and availability. Other Activities: Snow boarding, sledging, husky dog rides, ice skating, ice climbing. summer trekking, snow walking etc. All rates include linen, towels. It also includes electricity, heating and final cleaning and free WiFi. Also included are the Guest cards giving discounted parking and various around Saas Fee discounts, full details from the Sass Fee Tourist Office.